Brown and black look so good together. Created using American tanned English Bridle leather. For the person that wants a very quick and easy cuff in a visually more refined package. Our new line of slim restraints don't compromise quality or strength. These restraints are the fastest and easiest to get someone into. They also fit nicely into a purse or pocket for that surprise encounter. Features a substantial 1 1/4" wide bridle leather top and a two ply soft hood leather lining. The locking post can secure your willing victim using a padlock or even a twist tie. 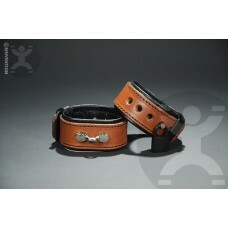 The leather keeper strap prevents these cuffs from the dreaded spinout and keeps everything nicely in line. Locks are not included. Large Bicep fits - 10" to 15"